Stein, Garden State), the Second City alum best know for her bawdy and hilarious turns on Broadway in Hairspray and Xanadu, is heard here: salty, saucy and uncensored. (In her own words, "It's fun, it's filthy, it's me.") 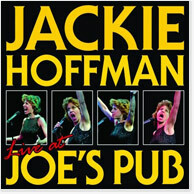 Jackie's unique blend of cynicism, stand up and original songs will make you realize why her shows at Joe's Pub are the stuff of New York legend. Time Out New York called Jackie "the funniest woman in America," and The Village Voice hailed her as a mix of "Carol Burnett's rubber face, Sarah Silverman's outrage, Ethel Merman's vocal throttle, and Gladys Kravitz's world view." Here she leaves no comic stone unthrown, targeting everything from West Side matrons to public displays of affection, from the vagaries of show business to her own mortality. The New York Times proclaimed, "Jackie has a love-hate relationship with her audience: she hates and they love." Not for the warm and fuzzy, politically correct or faint of heart. "Jews in the World of Entertainment"